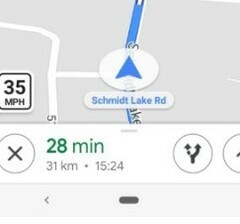 In 2017, Google tested out a new feature in Maps that showed speed limits in turn-by-turn navigation mode. This update, which was tested in 2 major cities, became less accurate over time, and was eventually axed over time. Now, it appears the app is trying this function out again. It is reportedly available to users in some parts of the US. Google is currently trialling another method to enrich traffic information in its Maps app as it directs drivers to their destinations. This involves the inclusion of speed-limit data to streets in turn-by-turn mode. The search giant had tried to add this feature to Maps before. Users in Rio de Janeiro and San Francisco had had access to this extra layer of guidance. However, it became less and less accurate per road over time, and was scrapped shortly after its introduction in 2017. The ability to see speed limits in Maps has now returned. However, users who are located in New York, Los Angeles or Minnesota are the only ones who have reported its appearance so far. It appears as a new icon in the bottom left corner of the Maps view in turn-by-turn mode. This is possibly due to the proportionately greater populations in these areas, and, thus, the increased likelihood that the speed-limit information will be accurate. It is not clear how useful the new addition to Google Maps will turn out to be, or if it will last this time around. However, it may be something to gain a new feature in this app, which has not been updated since the addition of the option to search for e-vehicle charging stations along a given route.